I also worked on my BFF sock. I'm down to the heel flap now! This sock isn't actually this bright! Unfortunately I had to rip out my other socks. I messed up on the increase - I'll start over soon (I need to brush up on some basics - it's been awhile). I also decided to start a scarf. I have always loved this scarf made by Brooklyn Tweed. I went through my stash and found the perfect yarn (yarn I was using for a couple of sweaters that I know I'll never finish). Hopefully, I can get it finished and the sock finished soon! Write later! I love the colors for you socks. So pretty. And the one for the scarf is simply beautiful. Beautiful stitching too. Gorgeous scarf! Shores is really coming along too - you'll be done with that block in no time! Great progress on Shores. 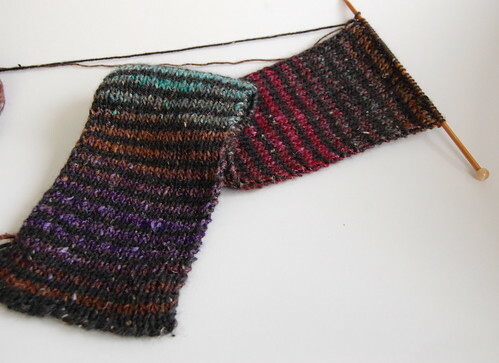 I've knit 3 of the Noro scarf. As someone who isn't fond of the yarn, I really do like how it knits up. The color changes are stunning. Lovely progress on Shores, and ohhhh, your knitting! I LOVE these Noro stripey scarves! Just love the colors in your scarf. Right up my alley! And love your socks too. I'll bet those are going to be so warm. And you're making great progress on Shores too! love your stitching and knitting both. It's great that you've gotten back into knitting again. Maybe I will sometime too. Love your progress on Shores. The rocks did me in and I ditched the whole project. pitiful on my part. Yours looks great! Love the pink socks and the scarf, too! Shores looks great, but your knitting dazzles the eye - GORGEOUS! Wow, Nicole - you can see dimension in those rocks - cool! But the knitting takes the cake ... that COLOR is gorgeous, stunning - yowza - beautiful! Your stitching is beautiful of course and I really like the yarn colors you have chosen for the scarf! Nicole, Shores is moving along. I love the yarn for the scarf. I just started my first pair of socks but I'm thinking the ribbing is not right so I'll probably be ripping it out. Love each one of your WIPs! 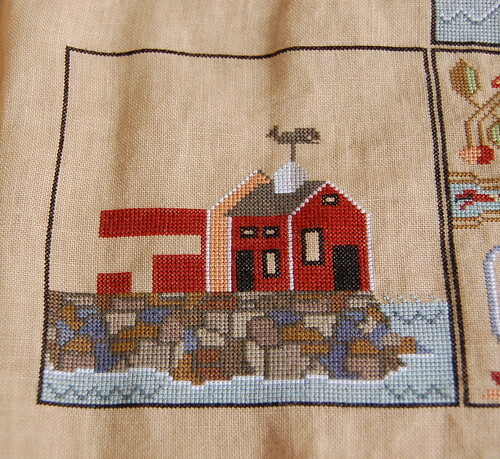 Love your knitting, and that block of Shores is coming along nicely! Love your shores, love your socks, and love your scarf. I tried 2 socks at a time once...too much frustration. 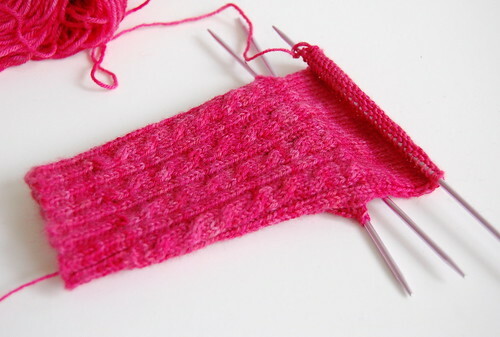 But I can sure knit up socks in a hurry on one long needle...magic loop. I love that technique. I've knit quite a few scarves using Jared's pattern as well. Have a great week!! Nicole, your Shores is just gorgeous. Remind us again what fabric and fibers you are using. The colors just pop! c'est magnifique ce que vous faites , toutes mes félicitations !